Dryfruits and mawa or khoya is a lethal combo for sweets.It is a great way of having dry fruits in daily life.I love making barfi during festive season.You can make it using mawa from market or just make it from milk powder. Here I have used another method for making barfi by just reducing full fat milk.Akhrot barfi-walnut fudge,almond squares /badam barfi,kaju katli,khorak are some great ways of incorporating dry fruits in your diet. Yes, you need to ensure sugar intake is well balanced with exercise. 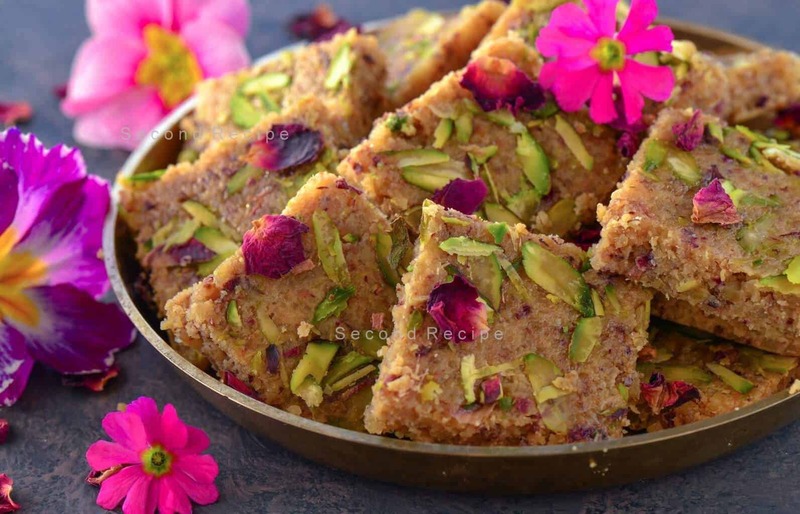 Here we have given a twist to normal walnut barfi with the goodness of rose petals. It gives a great flavor to barfi.However. you can simply use rose water if you do not have petals available. Reduce 1 ltr milk to 250 ml. Crush walnut kernels to small pieces. Add the walnuts,rose petals to it and cook till you get semi-solid consistency. Grease tray with 1 tsp ghee. Pour the walnut mixture on greased tray.Garnish with pistachios & few rose petals. Make incisions with a knife on the mix. Set in refrigerator for couple of hours. Click here to see more sweet recipes. Click here to see more recipe videos. Akhrot Ka Sheera or Walnut Halwa is often prepared during the winter months, as it is believed to keep the body warm and protect it from the bitter cold. It is considered to be auspicious for Holi and Diwali and it even features on wedding menus. Walnut is a wrinkled biggish nut that is encased in a very hard shell. It has several known, impressive benefits and contains high quantities of omega 3 and antioxidants that is good for your brain. It’s usually commonly added to desserts, but in this halwa it is the main ingredient!